What do we learn from self-portraits? 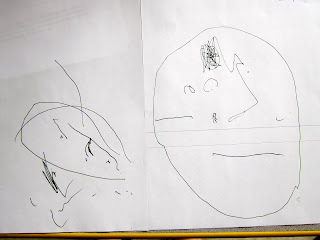 In both September and June - the beginning and end of the school year - I ask my preschoolers to make a self-portrait. I set them up with a mirror and a special pen (thin, black felt tip marker) and a simple piece of white cardstock. I love comparing the two drawings each June. These simple drawings are extraordinary windows into how much the children have grown and developed over the school year. What a wonder it is to go from being a three year old to a four year old! I am amazed. Let me share a few of these self-portraits here, so that you might see this growth, too. For each of these, last September's is displayed on the left and this June's is on the right. 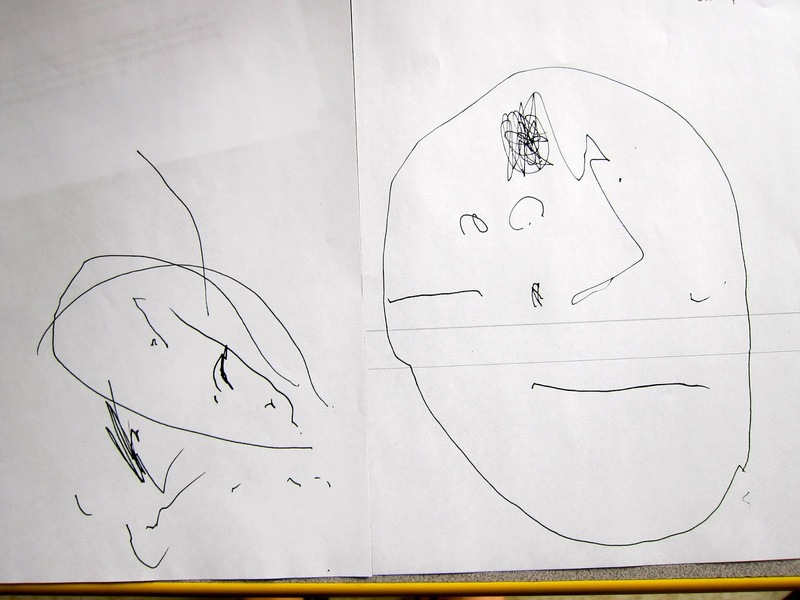 Consider the risks the child takes in representing these new observations on paper - it is as if the preschooler artist is unfettered, soaring with ideas, determined to share them all. 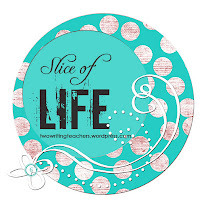 through drawing, painting, beading, cooking, hammering, other. Fun and silly ways that we "looked for details,"
or searching for tiny gems and beads in the midst of a pile of sand in the sensory table. to make a sign for a block project. because I keep these at the ready in the science and dramatic play areas. to see light reflected on the ceiling or wall. lead to these June self-portraits. from being three years old to being four? Truly, these self-portraits are a gift for my eyes. I feel a lot of joy when I study them. Yes, we had a very good year together. I always like to create a poem with the children to commemorate the school year, one that highlights their memories from our time together. When the children shared their favorite memories aloud, I grouped their responses into categories of like items and I added a few thoughts of my own. [I continue to think of more fun things that we forgot to include - for example, how did everyone forget the Phillips Art projects?] Next, I decided to borrow from a poem experience I learned about last summer in professional development and insert the phrase "We are from..." throughout the poem, as an anchor, to remind us that we did these things together. I love that the children's memories are - by and large - things we did over and over - truly, these were integral to our year, what it means to be "a preschool Big Cat." I think this poem is pretty sweet! We have had a delightful year! We are from . . .
What foods did you hate? What did you/your family honor? What did people say to you? So many emotions, end of school year. They are, perhaps, not so well aware what that means. A big unknown, for a preschooler. They are feeling very emotional. I am feeling very emotional. Today, I received the biggest hug from one of my preschoolers, upon arrival at school. Truly, he leapt at me. I said, surprised, "Oh, wow, you are giving me a very big hug!" He said, "I can't stop hugging you, Ms. Ingram! I can't stop!" Have I ever heard more precious words? I can't stop hugging you, Ms. Ingram! I can't stop! It is the end of the school year and I am awash in doing final assessments of my preschoolers. how delightful I find the one-on-ones with these little ones. They say the most adorable things. she's recognizing them right away. "SQUARE! SQUIRREL! Oh, that reminds me, I saw a dead squirrel in a trash can on the way to school this morning, and my Mommy said she didn't like it, that she doesn't like squirrels, because they hurt our garden, they take our seeds and the plants don't grow, and this one was dead and it was in the trash can with flies, too." "Move the bear ON a block..."
He moves the counting bear to the appropriate place. But then he begins to build with the blocks. bear goes up the stairs. 'gotta go to sleep, bear. I love you, bear.' "
How high can a child count? Do they associate the number with a quantity? Let's look at their one-on-one correspondence. 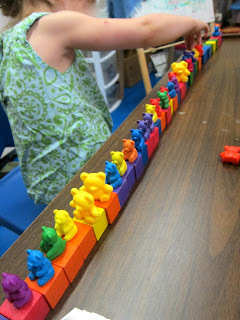 I have a large container filled with counting bears and another large container filled with small blocks. "No questions, Ms. Ingram...let me fix this, first!" She begins to build the longest line of blocks, using every single one of the cubes. "Now, let me give each bear a chair!,"
and she puts one small bear on each small block, painstakingly, unhurried. "Wow, that is a lot of bears and a lot of blocks...would you like to count them?" "One - two - three- four - five - six - seven - eight! I am good at this!!" How can I argue about her mathematical prowess when she has shown me such focus and precision in the creation of her line of bears? These assessments are too narrow in their focus! Children have so much more to share.